I’d be happy to help you out with this, would you please give me the URL of the page that you are having this problem on? Thanks for posting the URL. Social Meta in All in One SEO Pack Pro will use the Featured Image of your post or scan the post for images if there is no featured image, but it won’t scan through your custom fields for images. Is that what you are trying to do? Alright, I’m sorry but All in One SEO Pack Pro can not scan through your custom fields for images. If you use a featured image for each post then that is one the that All in One SEO will use for the og:image. So, if you set a featured image you can be sure it is the one that will be used and you do not need to add a custom field to do this. 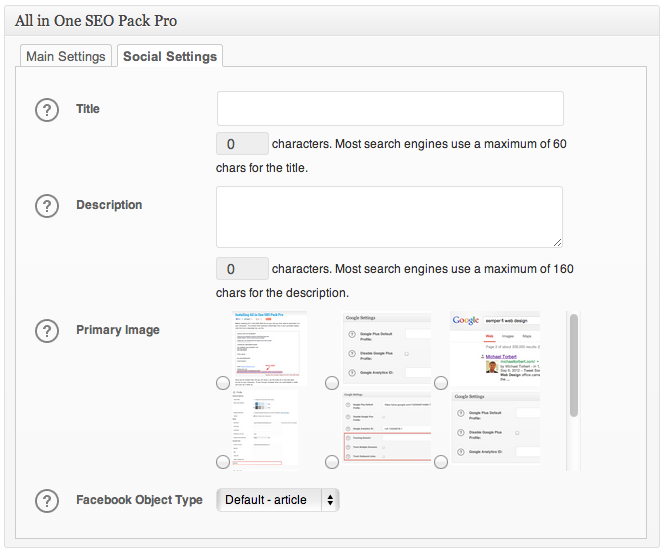 The ability to specify a custom field to look for images will be available in the next release of All in One SEO Pack Pro. I’m sorry that there isn’t anything we can do for you right now, but this will be available to you soon. We expect to have this ready for release next week. hello, please can help me make the modification manually? appear default, and custom field image, never fill that box, I choose to be automatic without image..